The Paris Feast: Angelina : The perfect Parisian tea break you should never miss. If you need more reasons for visiting Angelina then here is its brief history. 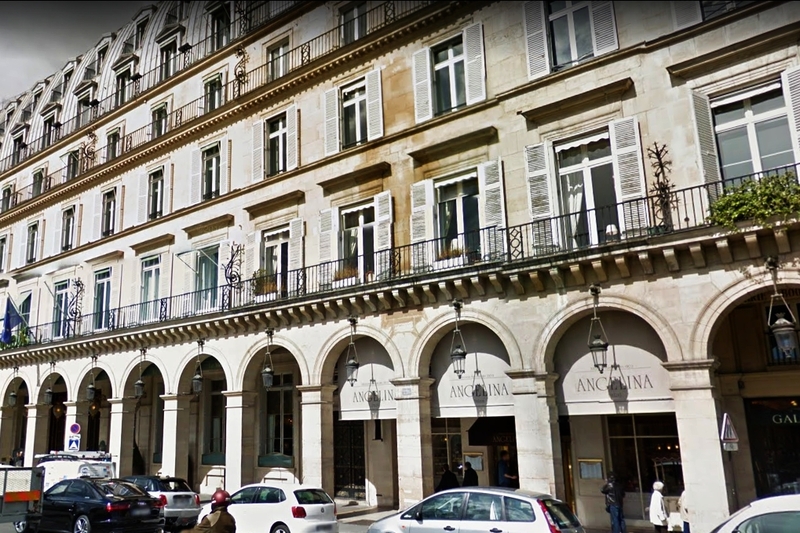 Angelina was founded in 1903 and their principal tearoom is located on the posh Rue de Rivoli right next to the Louvre museum. The interior of this mythical tea room was decorated by Edouard-Jean Niermans, the same man who designed many historic buildings in Paris including the Moulin Rouge. For more reasons, this tearoom was frequently visited by Marcel Proust. And for the icing on the cake, Madame Coco Chanel was a regular customer at this tearoom. She also had a fixed table, #10 adjacent to one of the mirrors and if I have to go by her biography, she loved mirrors and used them to coyly keep an eye on the world around her. Ok, now that I have convinced you check Angelina out, let us now see what you can do, or rather what you should taste once you are there. Angelina serves lovely breakfasts, light lunches and high teas. Presently there are 7 other tearooms in different prime locations across Paris. The one I love is located just next to the Luxembourg Museum in one of the most beautiful gardens of Paris, the Luxembourg garden. The interior of this tearoom like the one at Rue de Rivoli, has a belle époque style interior and I'm in love with those beautiful marble tables, gilded walls and laced curtains. This is also my pit-stop during my frequent visits to the Luxembourg museum and the garden. If you happen to visit one of the expositions at the museum you may also chance upon a special item on the Angelina menu dedicated to the exposition. Angelina is famous for their fudge like thick hot chocolate and a dessert named Mont Blanc. This little cup sized delight consists of meringue, whipped cream and chestnut cream vermicelli. You must try this out, but sometimes on weekends they may run out on the stock if you happen to visit the tearoom at 4 P.M. In fact Angelina do not store their pastries but prepare them at the tea room on the same day. Then there is the Millefeuille which is a typical French layered pastry consisting of caramelized puff pastry and light Bourbon vanilla cream. Apart from these classics a lot of other things too can be devoured on at Angelina. I'm in love with their club sandwich. Be careful, the portion is quite large for 1 person, be prepared to share the delicacy. Then there is the croque monsieur which is another typical French specialty (though the one at Angelina is not the traditional croque monsieur but a modified original version). And they also have a good collection of icecreams and sorbets and I just love the mango sorbet. Trust me, it is no different to taking a bite of a real (frozen) mango. Then above all Angelina is a tea room and I love the jasmine flavored green tea that they serve there. You can also buy loose tea leaves at the tearoom. Sitting in Angelina, eating a dessert and looking at the crowded room via the mirrors give a different perspective to the Parisian afternoons. Hope to see you in Angelina, the next time I am there.